For nearly forty years Star Wars has been one of the biggest- if not THE biggest franchise in popular culture. It's hardly surprising that such a huge expansive universe has made it's way into animation numerous times. As Star Wars Day arrives again, what better time to look back at some of them? Before there was Jar Jar, there were the Ewoks. Nerd consensus seems to say that everyone hates the warrior teddy-bears, but the truth is that kids of the time took them to their hearts.The animated TV series followed the adventures of Wickett, and his friends Kneessa and Teebo on the Forest Moon of Endor. The series ran for a total of 35 episodes and featured an Endor largely untroubled by the Empire, al least until the end of the second season. In the series, Wickett's family name was Warrick- a nice nod to the actor Warwick Davis who originally portrayed Wickett in Return Of The Jedi. Broadcast around the same time at the Ewoks show, but running for just a single season, Droids followed the adventures of the saga's most iconic robotic characters, R2-D2 and C-3PO. Set prior to the events of A New Hope, it followed the droids as they moved between various masters and got into numerous scrapes. Original C-3PO actor Anthony Daniels reprised his role for the series, which was later packaged with the Ewoks show to create the Ewoks and Droid Adventure Hour. Long before Robot Chicken, British comedy duo Adam Buxton and Joe Cornish made totally unofficial parody segments featuring vintage Star Wars action figures in unlikely situations, often featuring parodies of popular TV shows of the day, such as Chew Wants To Be A Millionaire and Jedi Springer. The segments were part of a variety that was full of other parody sketches and silly songs and like the rest of the series had a ramshackle and home-made charm. It would be nearly another two decades until Star Wars officially came back to animation. This 2D animated series related to the Prequel trilogy (no wait, come back!) and was made to fill in the gap between the second two prequel films. Directed by Genndy Tartakovsky and aired on Cartoon Network it is often considered one of the few bright spots to come out of Lucas's second trilogy. The series has an unusual format, with the first two seasons running for 3-minute episodes and the third and final expanding to 12 minutes per show. This later CG series occurs over the same space of time as the earlier series. However, running as it did for six seasons of 22-minute episodes, it had considerably more room for more complex storytelling than Tartovsky's more action orientated shorts. Starting with a theatrically released animated film of the same name, the series featured characters from the prequel trilogy and also many original characters who would go on to become fan favourites in their own right. Fans were upset when Disney bought LucasFilm and the Clone Wars was nixed in favour of a new XD show. 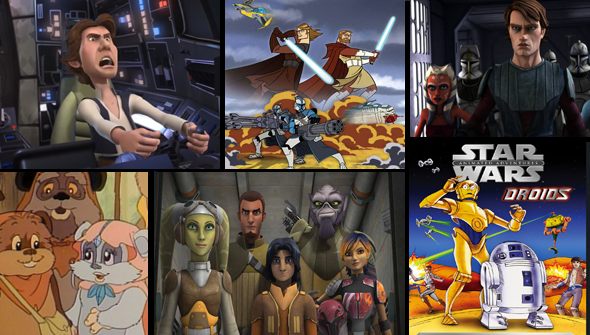 However, they quickly warmed to the new show, which many would argue is the best animated Star Wars effort to date. The new series takes place five years before the events of Episode IV and features a cast of new and very likable characters who journey aboard a ship named the Ghost. Two seasons have aired to date, but there is a (new) hope that it will run for years to come.